SIDE EFFECTS: Nausea, dizziness, drowsiness, trouble sleeping, constipation, headache, or dry mouth may occur. If these effects persist or worsen, notify your doctor promptly. Remember that your doctor has prescribed this medication because he or she has judged that the benefit to you is greater than the risk of side effects. Many people using this medication do not have serious side effects. Tell your doctor immediately if any of these unlikely but serious side effects occur: fainting, mental/mood changes (e.g., confusion, depression, hallucinations, memory problems), increased difficulty moving/walking, muscle cramps/spasm, restlessness, decreased sexual ability, increased shakiness (tremor)/stiffness. Tell your doctor immediately if any of these rare but very serious side effects occur: swelling of the ankles/feet, chest pain, compulsive behaviors (e.g., pathological gambling), fever, unusually fast/slow/irregular heartbeat, muscle pain/weakness, unusual tiredness, change in amount of urine, vision changes. 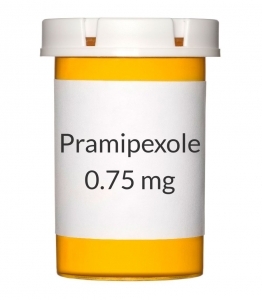 Some people taking pramipexole have reported falling asleep suddenly during their usual daily activities (e.g., talking on the phone, driving). In some cases, sleep occurred without any feelings of drowsiness beforehand. This sleep effect may occur any time during treatment with pramipexole, including up to 1 year after starting the medication. Therefore, you should not drive or take part in other possibly dangerous activities until you are certain that this medication will not cause drowsiness or sudden sleep. If you experience increased sleepiness or fall asleep during the day, do not drive or take part in other possibly dangerous activities until you have discussed this effect with your doctor. Your risk is increased with use of alcohol or other medications that can make you drowsy. You may also develop a sudden drop in blood pressure, which can cause dizziness, nausea, sweating, and fainting. This is more likely when you are first starting the medication, when your dose is increased, or when you get up suddenly. To lower your risk, get up slowly from a sitting or lying position. A very serious allergic reaction to this drug is unlikely, but seek immediate medical attention if it occurs. Symptoms of a serious allergic reaction may include: rash, itching/swelling (especially of the face/tongue/throat), severe dizziness, trouble breathing. This is not a complete list of possible side effects. If you notice other effects not listed above, contact your doctor or pharmacist. In the U.S. - Call your doctor for medical advice about side effects. You may report side effects to FDA at 1-800-FDA-1088. In Canada - Call your doctor for medical advice about side effects. You may report side effects to Health Canada at 1-866-234-2345. OVERDOSE: If overdose is suspected, contact your local poison control center or emergency room immediately. U.S. residents can call the U.S. national poison hotline at 1-800-222-1222. Canadian residents should call their local poison control center directly.